I’ve written several articles highlighting HealthEquity Inc. (HQY) since the sub $40 range as a great play on the secular growth in the Health Savings Account (HSA) space that’s mostly independent of legislative actions, the drug pricing debate or rising insurance costs. HealthEquity is not an insurance company thus does not possess any liability for coverage in any capacity nor does the company play any role in the pharmaceutical supply chain. HealthEquity is at the center of a healthcare paradigm shift where consumers are taking control of their healthcare dollars via leveraging HSAs. HealthEquity manages funds allocated for medical, dental and vision expenses that are deducted on a pre-tax basis and deposited into a dedicated HSA account. 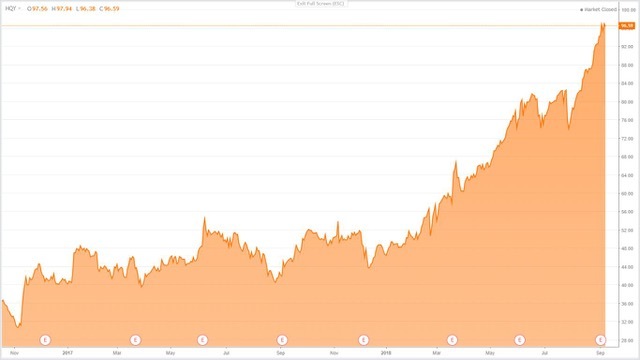 The company blew out the numbers when it reported its Q2 FY19 results with the stock following suit breaking out above $95 per share to an all-time high of $98 and looking to break through $100. HealthEquity manages $7.0 billion in assets across 3.6 million accounts against a potential market maturity of $1 trillion in assets across 50-60 million accounts. The durability of this growth has a long runway due to the secular growth in the HSA market. The company is sitting on largely untapped revenue sources where the vast majority of account holders have yet to invest any HSA money in investment offerings. Expanding margins for greater profitability is also unfolding as the older the account, the greater the gross margins observed. HealthEquity is currently sitting on a healthy balance sheet with ~$303 million in cash and cash equivalents with zero debt. The company is posting accelerating revenue, cash flow, margin expansion and income growth with a strong balance sheet. I feel that HealthEquity will continue to post strong growth as it services the double-digit HSA growth market and manages more assets, accounts, and investments within these accounts. HealthEquity may be a great long-term investment in the healthcare space that’s independent of the health insurances, pharmaceutical supply chain companies, drug makers or pharmacies. The current valuation is rich in an already frothy market thus caution at these levels is wise. Q1 FY19 earnings delivered another double-digit growth story across the board with revenue coming in at $71.1 million, an increase of 25% year-over-year. Net income came in at $22.5 million, an increase of 33% year-over-year. Total HSA members came in at 3.6 million, an increase of 23% compared to Q2 FY18. Total custodial assets were $7.0 billion, an increase of 31% compared to year-over-year. “HealthEquity recorded another strong quarter financially and operationally as we added over 121,000 new HSAs and $170 million to our members’ custodial assets, resulting in record quarterly revenue and earnings,” said Jon Kessler, HealthEquity’s President, and CEO. “As we continue to deliver on our commitment to connecting health and wealth for our members, we are well positioned to outpace the market by providing comprehensive retirement solutions to our members and being the market’s purple standard for remarkable service." The company is in a very healthy financial position and had $302.9 million of cash, cash equivalents, and marketable securities and no outstanding debt. Total custodial assets were $7.0 billion, an increase of 31% year-over-year which is broken out into custodial cash assets of $5.5 billion, an increase of 23% and custodial investment assets of $1.5 billion, an increase of 72%. The latter will serve as a major growth driver as I highlighted in previous articles as an untapped revenue source. We’re witnessing the early adoption of this revenue source now that $1.5 billion is allocated in investment assets. Collectively, these great financial metrics have translated into fantastic stock performance over the past year with the stock nearly tripling (Figure 1). HealthEquity is one of the major players in the HSA secular growth market and has continued to gain market share over the years. Currently, HealthEquity manages $7.0 billion in assets across 3.6 million accounts against a potential market maturity of $1 trillion in assets across 50-60 million accounts. The company currently has 15% and 14% market share in a number of accounts and custodial assets, respectively. HealthEquity has been growing market share with plenty of market expansion ahead of itself. HealthEquity has managed to move into the #2 spot in market share for both HSA dollars and custodial assets. The growth runway is vast for HealthEquity with an ever-expanding market over the coming years. Assuming a 15% penetration in both the number of accounts and assets, HealthEquity’s maturity may come in at 8.25 million accounts and $150 billion in custodial assets, respectively. HSAs are becoming an invaluable option for consumers to contain medical costs and take control of healthcare spending. High Deductible Health Plans (HDHP) coupled with HSAs contained family plan deductibles at a far lower level than any other healthcare plan (Figure 2). 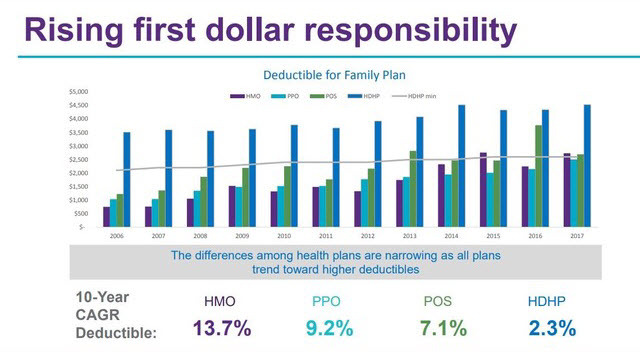 HDHPs have a 10-year CARG deductible of only 2.3% while the HMO model comes in at 13.7% over the same period. Additionally, funds deposited in the companion HSA account can be invested into mutual fund options to grow these funds over time. At age 65 these funds can be withdrawn without penalty at your effective rate, effectively serving as a second 401k over time. This dual-purpose account serves as a great means to contain healthcare costs while building wealth via investments over the long term. HealthEquity is posting accelerating revenue, cash flow, and income growth. These growth numbers have continued the uptrend over the years and with its strong second quarter for FY19. The company is sitting on untapped revenue sources and plenty of room for margin expansion. Regarding untapped revenue sources, of the 3.6 million members, 96% of account holders have yet to invest any money within its HSA accounts (Figure 3). This serves as an untapped pool of money that can be invested in various mutual funds while HealthEquity collects a small fraction of the dollar amounts invested in these investment accounts as management fees. Considering that the average age of an account is only 3.5 years and over 41% have been open for 2 years or less, this provides ample opportunity for future penetration in this investment space. 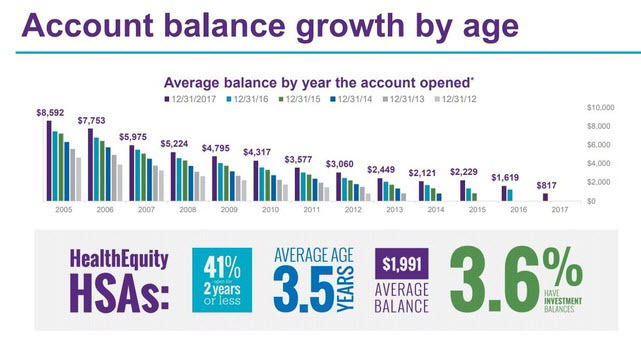 Given the fact that these account balances are correlated with age translates into more probability that any surplus will be invested to drive account value (Figure 4) further. As the company continues to grow, the float of HSA funds is expanding at a rapid clip year-over-year in a rising interest rate environment which only contributes to bottom line revenue to underpin the business. Figure 4 – Older accounts contain more assets, have higher gross margins and give rise to potential conversion into the investment option of HSA accounts. HealthEquity Inc. (HQY) continues accelerating revenue, cash flow and income growth across all segments of its business in the backdrop of an HSA secular growth market. The company is debt-free and expanding its balance sheet with just over $300 million in cash and cash equivalents. HealthEquity has been growing market share with plenty of market expansion ahead of itself. HealthEquity currently manages $7.0 billion in assets across 3.6 million accounts against a potential market maturity of $1 trillion in assets across 50-60 million accounts. The company is sitting on untapped revenue sources, and gross margin expansion is beginning to bear fruit as accounts age and more funds are channeled into investment vehicles. 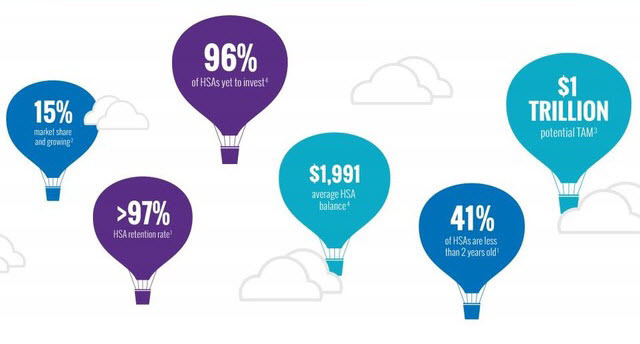 The most recent quarter posted an increase of 72% in investment assets within HSAs. HealthEquity is continuing to post strong growth as it expands the number of accounts, manages more custodial assets, expands gross margins and more accounts transitioning into investment vehicles. The HSA market is a double-digit growth market, and HealthEquity will continue to grow in lock-step while delivering more offerings to its clients. Furthermore, HSAs are serving as a dual purpose as a healthcare containment play while serving as a second 401k as assets can be withdrawn in retirement without plenty fueling the popularity of these vehicles. Disclosure: The author no longer holds shares of HealthEquity. The author has no business relationship with any companies mentioned in this article. He is not a professional financial advisor or tax professional. This article reflects his own opinions. This article is not intended to be a recommendation to buy or sell any stock or ETF mentioned. Kiedrowski is an individual investor who analyzes investment strategies and disseminates analyses. Kiedrowski encourages all investors to conduct their own research and due diligence prior to investing. Please feel free to comment and provide feedback, the author values all responses. The author is the founder of stockoptionsdad.com a venue created to share investing ideas and strategies with an emphasis on options trading.